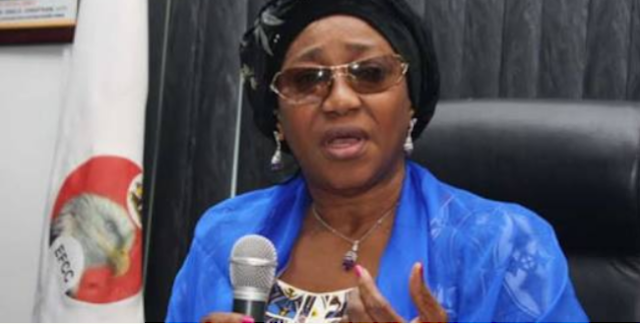 A former Chairman of the Economic and Financial Crimes Commission, Mrs . Farida Waziri, says she was glad in retrospect that ex - President Goodluck Jonathan kicked her out of office . She said had she not been sacked , she would have been traumatised by now , given the ongoing revelation of alleged grand corruption that took place under Jonathan’ s administration . Waziri said the EFCC under Jonathan was not given free hand to operate, saying she got the first indication of it during the probe of the fuel subsidy scam . She said it was her refusal to back down from the probe of one of the masterminds of the fuel subsidy scam that earned her a dismissal by Jonathan . A statement on Sunday quoted the ex - EFCC helmsman as saying this during an interaction with journalists at an unnamed event , which she attended in Lagos at the weekend . She was said to have been asked to react to the revelation about the alleged grand sleaze that took place under Jonathan’ s watch . “ I’ m only glad that those things didn’ t happen under my watch as the EFCC Chairman because it would have been too traumatic for me . And that is why if I see President Jonathan today , I will kneel down to thank him for the honour done me by removing me as the EFCC Chairman at the time he did . “ My first strong premonition of what was ahead was when I began the probe of the monumental oil subsidy fraud going on then. “ I came to Lagos on a vital intelligence on the subsidy scam and as soon as I arrested a key culprit I got a call from the Presidential Villa asking me to release the suspect , because , in their words , ‘ he is our person ’ , but I refused to let him off and days after I was removed from office , ” Waziri was quoted to have said.